Cusco is beautiful and charming, but is overrun with tourists (a hypocritical thing to dislike about a place). It has good energy, but none of the restaurants, bars, luxury hotels, or english signage seemed authentic. And even though the city is a destination in it’s own right, many of its visitors are simply passing through on their way to Machu Picchu. Just like me. 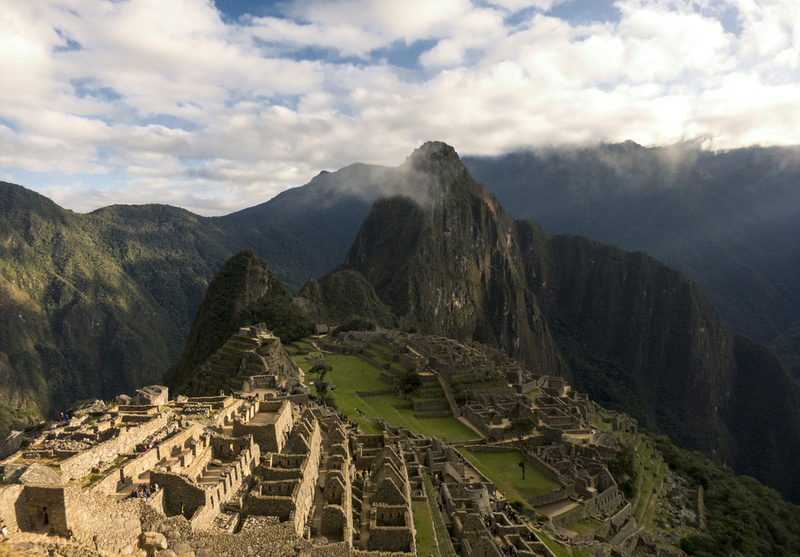 These days, the Inca Trail requires a reservation at least six months in advance. So I chose the lesser-known, but highly recommended, five day Salkantay Trek. I arrived in Cusco a couple days early to acclimate and attend a sketchy “orientation.” Bring $100 to tip us. Your rented sleeping bag will be too small. Altitude sickness may affect you. The first night will be -3˚C. Be ready tomorrow at 4am. Don’t complain. Our apparent guide didn’t introduce himself, or ask for our names. He was so chilly, we all wanted out. If his goal was to lower our expectations, it worked. Everything was well thought out and carefully organized. The trek was beautiful, our guide warmed up, the five course meals were good by any standard, and our group was a lot of fun. There were 7 paying customers, and probably six guides and porters with five donkeys. We hiked roughly 40 miles over five days, climbing from a picturesque valley to a barren 15,000 foot pass, then descending into the beginnings of the Amazon Rainforest. In a few hours, we went from snowy peaks to wild strawberries, colorful orchids and coffee plantations. It wasn’t always easy - 4:30 am wake up calls, long hikes, altitude headaches, mosquitos, quad-busting climbs, and relentless, knee-rattling descents - but the scenery alone was worth the money and the hassle. Arriving at Machu Picchu for sunrise on the last day was icing on the cake.